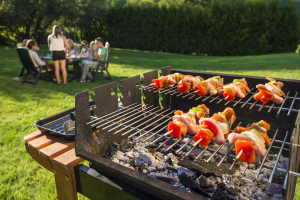 For those of us who have less space or enjoy tailgating, there’s always the option to go for a portable gas grill. They don’t cook food as well as some of the larger grills but there are a few portable options that come pretty damn close. Here’s a list of what I think are the best portable gas grills currently available. These are the best according to me, we’ll just have to agree to disagree! Time’s not far when we’ll have remote controlled, battery operated, Bluetooth activated grills for cooking, with a robot to serve the food. Until then, we’ll have to make do with these awesome portable gas grills and put in the work! Let me know what thou thinketh of my list?